John O'Farrell talks about his book Things Can Only Get Worse. “The book that influenced me early on at age 13 was Animal Farm – it is satirical, political and accessible and it didn’t have a happy ending. I thought it was great and it awakened in me an interest in the Russian Revolution and the first stirrings for political writing and satire. So consequently I read all the Orwell novels, which I found revelatory. “I first appeared at Off the Shelf 20 years ago when I had written Things Can Only Get Better, and I stayed overnight as I was interviewing Nick Hornby. I never thought I’d be here now with a book about how things have gone wrong…Things Can Only Get Worse. I liked the festival so have come back. 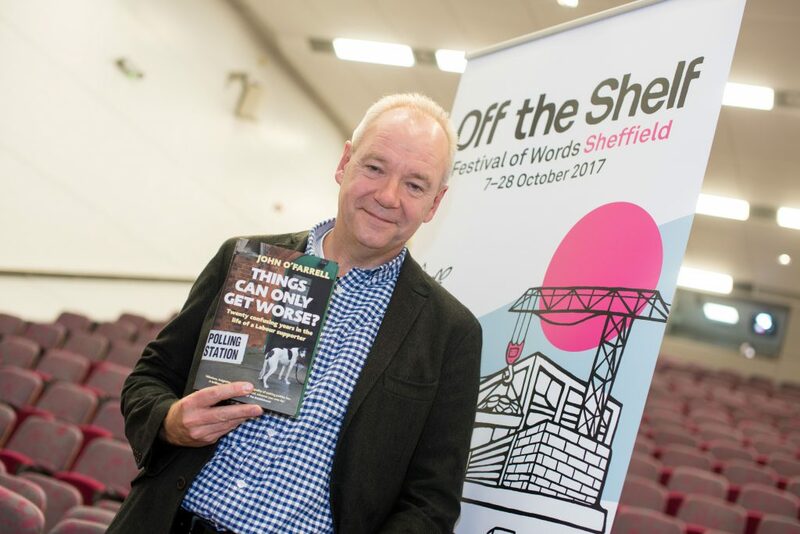 “My son did history and politics at the University of Sheffield and I could see the huge change the city has experienced. It is a vibrant place. Sheffield is culturally dynamic and obviously very friendly. It is a compact city and a good size. I love its radical tradition and I have visited it more than any other city in the UK. “Literature festivals vary enormously. Some are real scams charging £16 for 40 minutes with the author and consequently someone is making a lot of money and it isn’t the author.